The Baqend CLI can easily be installed globally with npm install -g baqend (to get npm you just need to have Node.JS installed). Afterwards you can use the CLI by typing baqend --help in any folder. Note: Ensure that your PATH system enviroment variable contains the global npm bin path ($ npm bin -g) to let npm installed commands work properly. Tip: A good way to manage a Baqend-based project is to manage the files and collaboration via git and using the CLI to deploy files and code to Baqend. Note: The extra -- are required to seperate the npm run arguments from the Baqend ones. Before you can actually deploy assets and code you have to create a Baqend account. The easiest way to use it is the baqend register command. If you already have an account, you are able login the CLI by typing baqend login. These commands will save your credentials locally. If you do not want so save your login credentials, you can skip the login step and provide the login credentials each time you deploy. Note: If you have created your Baqend account with OAuth (Google, Facebook, or GitHub), you must add a password to your account first. This can be done in the account settings of the dashboard. You can also use the CLI in combination with Baqend's free community edition. For logging into a self-hosted Baqend instance, you simply have to provide the connection URL instead of the app name when using the baqend login command. The trailing /v1 is required as it represents the API endpoint of your Baqend server. You can host the static files and assets of your web app on Baqend. Therefore, move your working directory to your app root folder. We expect you to have a folder named www by default that is uploaded to the www folder in Baqend Files and served as a website. Tip: If you want do upload a different directory, you can use the --file-dir or -f option to specify a directory: baqend deploy --file-dir dist. The files are then hosted from Baqend. Read more about Baqend Hosting in the Hosting chapter. The CLI can additionally deploy your Baqend Code. Baqend code should be located in an folder named baqend. The following screenshot visualizes a typical project layout including Baqend code. All Baqend modules should sit top level within the baqend folder. 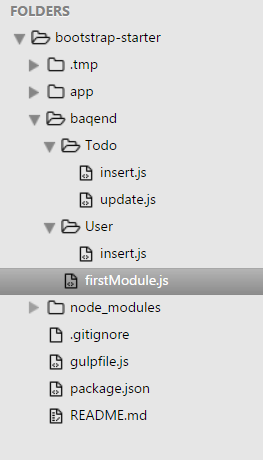 For example, baqend/firstModule.js will be uploaded as firstModule. Therefore baqend/User/insert.js contains the insert handler code wich is invoked each time a new user object is inserted to the User table. Read more about Baqend code in the Baqend Code chapter. After deploying your app, you can open it by typing baqend open or use the dashboard with baqend dashboard. You can download and upload your app schema as well. After downloading your schema, the CLI will create an own json file for each class in the baqend/schema directory. When uploading your new schema, either only new fields are added to you schema and no fields will be deleted or the schema will be completly replaced, depending on wether you use the -F option or not. It's also possible to upload your new schema every time you're deploying your baqend code by adding the -S option to the baqend deploy command. The Baqend SDK itself comes with a TypeScript declaration file, which enables seamless integration into TypeScript and allows better code completion. The SDK comes with a dynamic API part, which is generated on the fly depending on your current schema. To make your TypeScript application work properly with this dynamic part you can generate the additional typings for your current schema with the CLI. With baqend typings your-app-name the CLI generates the TypeScript declaration file in the current folder. You can then add the generated file to your tsconfig.json file. You can update the generated file each time you have changed tables or fields in the Baqend Dashboard by just repeating this step. Tip: You should check the generated file into your version control system to share an up-to-date version of the definition file.